Only 1 piece was produced! Lamborghini Squadra Corse unveils SC18, the first single automobile in the history of the motorsport division in Sant'Agata Bolognese. 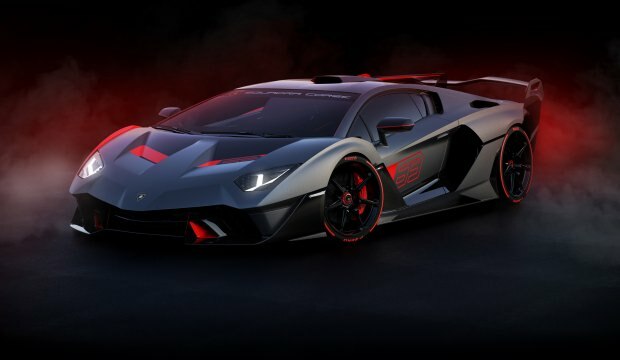 This unique example car, designed as a product of the synergy between the customer and the Centro Stile Lamborghini, will be used mainly on the track, although the car receives the necessary approvals for road use. The SC18 paves the way for new personalized development projects for motor sports customers under the brand of Squadra Corse. The car is specially developed for this model and has the most advanced aerodynamic characteristics from the competition experience of Squadra Corse. The air intake of the race elements starting from the front hatch is in the Huracan GT3 EVO style; the side and rear special bumpers, vanes and vents were inspired by the Huracan Super Trofeo EVO. The aerodynamic system, which is complemented by a wide carbon fiber wing with three mechanical settings, is able to create the optimum compressive force on every track. In addition, 12 air inlets on the rear hood - which have been successfully tested in endurance races - increase heat exchange and improve the cooling of the V12 engine. The powertrains, which represent the most advanced level of the Lamborghini, perform the performance of a real racing car: the ventilated 6498 cm3 V12 engine delivers 770 HP at 8,500 rpm and maximum torque at 720 Nm at 6,750 rpm. Along with this great power, the use of ultra-light materials and the new carbon fiber body reduce weight and the ground clearance is only 109 mm. The rear end is characterized by special exhausts and unique design and sound. The uniqueness of the SC18, the details of the carbon fiber body highlighted by Grigio Daytona (gray), and the red film prints reinforce the sporting feature. The interior features Nero Ade color (black) Alkantara and Rosso Alala color (red) cross stitches as well as carbon fiber bowl seats. The view is complemented by a remote measuring system, aimed at measuring 20 iyle in the front, 21 eyi single-bolt wheels at the rear and the specially developed Pirelli P Zero Corsa tires, as well as all-round performance on the track.